The Threadbare Couch: Carol Drinkwater: "The Olive Farm"
This January, curled up with blankets and pots of Assam, I have traveled to Yorkshire several times via Netflix instant play option, through the enchanting series "All Creatures Great and Small." I have mentioned this before. One of my favorite characters from childhood was Helen, the sweet wife of the veterinarian James Herriot (whose real name, outside books and television, was Alf Wight). Helen wore the classic, tweedy clothes of rural 1930's England, fashion I've always enjoyed and admired; and Carol Drinkwater is the actress who portrayed this woman so warmly. I got curious, in my January cocoon, about what Carol Drinkwater has been up to. It seems that she now lives in the south of France with her husband, attempting to wring olive oil out of hardy old trees, and writing about the life of the harvest-centered year. She has several books out now - "The Olive Farm," "The Olive Season," "The Olive Harvest," and "The Olive Route," along with a gorgeous illustrated format of the first. Her website showcases a gallery of photos from her trips around the Mediterranean researching the history of gleaning olive oil, as well as keen photos of the farm itself - and its many animals. This, if I may say so, is olive oil at its best: personal, local, rich, enjoyed. Banish the generic popular tv host brand; there are families at the farm who have known its hills and valleys longer than most, and it is their hands that pluck the olives from the trees. My chum Angie douses her life in olive oil, much to my amusement: like the father in "My Big Fat Greek Wedding" with his Windex, Angie uses olive oil for moisturizing and for healing cuts as regularly as others dabble it on their pasta. (That deep gash on her knuckle did heal amazingly quickly, though...) It makes sense, she says, a la "Thou anointest my head with oil..."
I will be including Carol Drinkwater's website in my list of links at the right, under "Where I've Been, Where I'll Be." I hope you enjoy it. Just glancing at the toasty rays of the sun in southern France warms a bit of the winter chill away. I must add how toe-wiggling-delightful it was last week when, after sending a brief "fan email", I received a gracious response. Joyous rapture! 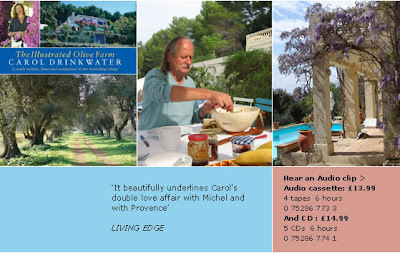 I am a long time fan of Carol Drinkwater, though I have not been brave enough to write a fan letter. I'm having another read of my copy of the Illustrated Olive Farm, a book I have owned for at least four years and idulge in reading whilst waiting for spring each year. Apart from my not being an actress, and the part of the world in which I chose to live, she and I have lived similar lives. She gives me courage. Nice article. Thank you very much for this incredible blog. I'm a medical student and I like to read such interesting articles. Keep posting and best of luck. Nice post. Really loved it. I read all the article, It is the best article all over the world and I know It is related to another health department but we have some product for you Online Generic Viagra is the best. Get all Online Marketing Services like PPC, SEO,SEM, SMM, SMO and more service to grow your business with us. All Are google and Facebook Certificated Experienced handle the projects with analysis and Strategy based Service on Social Media Marketing Services. Drinking a huge amount of cool water is not good for body health. Olive is really good for our health. This blog gives some information related to foods, meditation and etc...Keep it up.